The search for missing Linnea Lomax has come to a sad and tragic end. The body of missing UC Davis student Linnea Lomax was found near Sacramento’s American River. Detectives at the scene told law enforcement officials that there was “no reason to suspect foul play; however, the cause of death is under investigation. 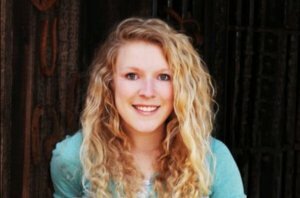 Linnea Lomax, a 19 year old freshman at UC Davis, went missing on June 26, 2012 after she had a mental break down while studying for final exams in June. Lomax had then checked herself into a clinic where she stated for 10 days. Following her release, she disappeared. Authorities identified a decomposed body found near the American River in Sacramento, Calif. as a missing freshman from the University of California, Davis. Linnea Lomax, 19, went missing on June 26 after leaving an outpatient mental health facility. The subsequent search effort ended when a search team found her body near the river Friday morning. Sacramento County Coroner Greg Wyatt later confirmed that the body was in fact Lomax’s, reports The Associated Press. 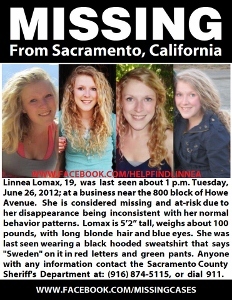 19 year old UC Davis student Linnea Lomax is missing and was last seen Tuesday afternoon, June 26, 2012 leaving an outpatient therapy center in the Sacramento area off the 800 block of Howe Avenue. She is considered to be at-risk because her disappearance is not consistent with her “normal behavior patterns” and she is also without her medication. The family of missing Linnea Lomax is concerned as they had pulled Linnea out of school right before finals due to her erratic behavior and put her into a mental health hospital for 10 days. Just one day after being released, she disappeared. Anyone with information about Lomax is asked to call the Sheriff’s Department at 916-874-5115. UPDATE I: UC Davis Teen Disappears Day After Release From Mental Health Hospital. “I think people call it a nervous breakdown. I don’t know if that’s the technical term for it but she just got so stressed she broke down,” said Craig Lomax, her father. Craig says she’s a perfectionist, a straight A student, and hard worker, always focused on doing her best. But, after struggling with a class and a few physical injuries, she started to change. “She had lost a lot of weight and she was very stressed, and she wasn’t being reasonable,” said Craig. UPDATE II: UC Davis student, 19, is missing after breakdown. The young woman’s friends and family say she had a breakdown while studying for finals. She spent 10 days in a treatment facility, where she received medication and was making progress, Warren said. Lomax then was upgraded to outpatient services, but she fled after lunch the first day. “Of course it was scary for her, and because she’s not in a normal mental state, she has fear that we’re out to get her,” Warren said. Warren said the young woman’s parents, who own a Christian youth adventure company, have not been able to sleep since she went missing, and they are working hard to find her. Some family and friends spent Thursday camped out at the Loaves and Fishes shelter, where she was reported to have been seen Wednesday, Warren said. For More updates and others opinions on this missing persons case, go to Scared Monkeys Missing Persons Forum: Linnea Lomax.